I am a small devotee of Sai Baba whom I liked from my childhood. I started reading weekly Parayan with an inspiration from my friends few months before Mahaparayan. It was my desire to read Sai Satcharitra from childhood which I couldn't do it till this year. One day, my friend told me about Mahaparayan reading which was going to get started from Dassera 2017 and asked me whether I too was interested to do it. In fact without any thought I said yes to her. Later on I got registered, I was added to a Whatsapp group and I got to know about how Mahaparayan reading goes for an year and its purpose through the group postings. I had a feeling to start reading weekly parayan many days before I got to know about Mahaparayan but some or the other way I couldn't start doing it. Baba has His own ways and He had solved my confusion by introducing me to Mahaparayan. Shirdi Sai Baba Devotee Aparna Vijayakumar from India Says : I am Aparna and I feel really blessed and it’s purely Sai’s grace that Iam part of this reading, there have been numerous miracles since the time I have started reading Sai Satcharitra and I am stating below what I experienced during the Mahaparayan . In the initial week, on Wednesday I came to know of a friend’s son 4 year old having a small swelling in the head and it was a matter of deep worry and was to be removed the next day through surgery. The next day I was reading chapter 7 and when I read Master Khaparde’s plague case I had tears in my eyes. Because Baba had answered my queries by Satcharitra that He will take care of the surgery and He is bearing the pain and the child will be safe. The child is extremely fine now by Baba’s grace. Shirdi Sai Baba Devotee Padmaja Madireddy From India Says : Sai Ram To all, my son is married for last three years. He is in US and his wife was away from him as per her job requirement, I used to be very sad about that. He was in Houston she was in Austin. Then he got job in SFO, so he had to go there. The Dussehra day when I read Satcharitra as it was 1st Mahaparayan . That evening I got a call from my son saying that his wife too got transferred to his place, I am very happy now. Baba Never Alone Takes Care Only Of His Devotees, But Also His Devotees Families And Their Acquaintances Also Come Under the Umbrella Of His Love, Eternal Bliss and Kind Grace. He is Omnipresent, Omniscient and Omnipotent no doubt. But above all this He is most merciful, kind and loving and cannot see His children unhappy. Baba does that is best for His devotees in the best possible way! Love You Sai Maa. Jai Sai Maa...! Anonymous Devotee of Shirdi Sai Baba From India Says: Am a big devotee of Shirdi Sai Baba since a long time. Thanks for the wonderful groups that are doing Parayanam. We have been experiencing good things with Baba's blessings. Our dreams came true back in 2010 when we did Sai Divya Pooja. From then everything by Baba's grace. About Maha Parayanam: I was part of it because of Baba's grace and reading chapters only because of Him. My son who's 4 is diagnosed with some problems which we were not able to accept it. But luckily we got good therapists and saw improvement in him. Shirdi Sai Baba Devotee Gowri Oberoi From India Says: I am Gowri from New Delhi and Baba is in my life since I was a child, as my parents are staunch Sai and are His bhaktas. I wish to share my experiences of how Baba pulled me to join Mahaparayan. Since a couple of years I have been sharing and reading Baba's devotees' miracle experiences and reading everyday blessings on facebook shared by Hetal Patil ji. I wasn't reading the experiences regularly but I have been wishing to start some Sai Sewa so with Baba's permission I started my own WhatsApp group in which I started to share everyday Sai Baba blessings with other devotees and everyone shares messages, videos and other devotional things there. One day as Baba pulled me, I happened to read Pooja Garg's dream experience and learnt about Mahaparayan. Inspired by that, on Gurupournima day, I planned to do a joint Satcharitra parayan in my group. That WhatsApp group had only about 24 people and only about 12 people agreed to do the group parayan and dividing the chapters we successfully completed that parayan. After that I saw the Mahaparayan registration form and registered online hoping and praying that I may be selected. Baba was definitely pleased as on the next Thursday I got a mail from Pooja ji asking if I can make and lead a group. Though I wasn't sure if 48 people would join my group, I happily agreed and initially only about 12-13 people joined. But it was Baba doing everything, so soon my group got filled and still people kept pouring in and soon, along with Kanika ji we had made 5 Mahaparayan groups. 2 Indian groups and 3 USA groups miraculously with Baba guiding us! I am a class teacher of MP-19 group. Shirdi Sai Baba Devotee Chaithanya Nallur From USA Says: Jay Sai Ram, Actually my 9 months old son was too good till he was in US. When we travelled to India in August he was getting one after another problems like viral fever, cold, cough etc. and the sad thing was he got abscess under chest which is very rare to get and doctor said the puss should be drained through surgery and only for that anesthesia also required. I got so scared and was praying Sai Baba that everything should go smoothly with Baba’s blessings. Finally he recovered very soon and even nurses and Doctors were happy for his fast recovery. I thank Sai Baba from bottom of heart for helping my baby for faster recovery without any complications. Shirdi Sai Baba Devotee Divya Achara From India Says: Om Sai Ram to everyone, I am Divya from MP-13 group. Firstly I would apologize to Baba and everyone for sharing my experience so late with everyone.I was very worried about my son’s job for many months and started the Maha Parayan with the faith that in this period my son will get a job. On the 5th of October when I was doing the Parayan, I wrote a letter to Baba expressing the above tension I was facing and that my son had an interview on the 10th of October and also said that Baba should accompany him after writing the letter. I kept it in the book, Sai Satcharitra, after chapter number 40, where the book has a photograph of Sai Baba, and on the 10th of October before sleeping I prayed to Sai and slept. To my utter surprise I felt that Baba got up from His throne and started walking towards my son. Anonymous Devotee Of Shirdi Sai Baba Says: Sai Ram To All and Pooja Ji, first of all, thank you to you and other volunteers for the Maha Parayan initiative. I feel extremely blessed to be part of this group. I have experienced countless miracles of beloved Baba in my last 20 years of association with Him. On a day to day basis I call Him numerous times from smallest things to some of life's biggest decisions and He is there for me every single time. I had written a detailed post in Hetalji's blog on how Sai saved me from a deadly disease and blessed me with a wonderful child. I would like to share two miracles of Baba I experienced recently, ever since I began the Maha Parayan for Baba's 100th Punyathithi. Now coming to my 1st experience, my 4 year old son often falls sick with terrible cough, cold and gets fever almost every month. On such occurrences his doctors prescribed antibiotics, quite frequently. I was always worried about the side-effects of excessive medications that was administered to him. He got an episode of cold and fever every single month in the past quarter August, September, and October. As November was progressing, I was scared for him since winter was approaching. I started giving him Udi water every day as it the only remedy I knew. To worsen my fear, last week he started getting green nasal discharge, terrible cough, leading to fever. This past Tuesday evening, his body temp was raising and it reached 101.3 in the middle of night. I was feeling terrible looking at him who was profusely coughing the whole night and could hardly sleep. I gave him the 1st dose of Tylenol and was mentally preparing myself to give more doses every few hours. Shirdi Sai Baba Devotee Shraddha Joshi From India Says: Om Sri Sai Ram, I am Shraddha and my Experience is as this. With Baba’s blessings I have a three year old son. We had been to Goa on 18th. It was 2:00 am when my three year old son started vomiting in hotel room. By morning 4:30 am he had vomited at least 5 times. Unable to understand and with no assistance from hotel staff, we took our son in our car to find nearby hospital or pharmacy to get medicine. We couldn't find even single hospital which was available 24/7. We travelled all the way from Candolim to Mapusa. We were disappointed that not even single hospital or pharmacy store was opened. On the way my son was still vomiting, I was losing hope to find any help. Then I saw a Sai Baba photo sticker behind a vehicle and prayed that we find way to heal my son. Just after that moment, we stopped our car where one person had parked his bike and was talking over the phone with someone. When we asked for help, he asked us to follow him and took us to Galaxy Hospitals in Mapusa. Though there was no doctor at that time, pharmacy was opened. I called our pediatrician in Bangalore and took advice from him and bought medicine for my son. My son was all fine after that. Shirdi Sai Devotee Shobha Nanaiah From Bangalore Says: I am Shobha from MP 108, Om Sai Ram to Pooja Ji and all Sai devotees. I am just a small devotee of Baba and I had a miracle of Baba that I wanted to share with you all. I am very thankful to Baba for giving me this opportunity to do MP and 365 days Parayan. Every Thursday I go to the Baba’s temple, on one such occasion when I went to Baba’s temple on Thursday and was praying for my daughter’s education, as she was preparing for her final exams suddenly the flower fell from Baba's neck. I was so happy and felt Baba has blessed me. But one sad news followed, due to some reason my daughter could not write the final exam. I was very upset and tensed and every day I used to ask Baba why He has done like this to me in spite of His blessings. But within a month my daughter had a chance to write her exams with Baba’s grace. I was very tensed about her results and always kept asking Baba for His blessings. One day I had a dream that Baba was sitting with a smile on His face, I stretched my hand to touch Baba and He too gave His hand. Then I asked Baba about my daughter's results, to which He said everything will be fine and then Baba disappeared. After a week results were out and my daughter passed, it was really a big miracle for me. Thank You Baba for everything. Anonymous Shirdi Sai Devotee From India Says: Hello everyone. I am just a small devotee of Baba. I wanted to share this experience which happened 1 week back, although not directly related to Mahaparayan but happened during Mahaparayan period. I wanted to visit Baba's Mandir on Thursday after Parayan completion but couldn't visit due to some reason, hence me and my mom decided to visit on Saturday. On Saturday we first went to Hanuman Mandir, had a blissful darshan and prashad and then headed for Baba's Mandir. When we reached there, Mandir was totally empty. Also the glass panel in which Baba's murti is placed was closed. I realized it was 1-2 pm and at this time Mandir remains closed for Darshan. I had taken two coconuts with me, one as an offering for Dhuni and one as an offering for my Loving Baba. I searched for Pujari ji, but he was also resting, so I decided not to disturb him. I offered one coconut to Dhuni and touched the other coconut with Baba's Padukas and Baba's small Murti kept outside glass panel and brought it back home with me. Shirdi Sai Devotee Maneesha Pednekar From India Says: I am Manisha From MP-129 Rajni Sai group, Sai Ram to everyone. Last year, July 2016, my son went to Australia to do Post graduation studies in film making. I prayed to Sai Baba to take care of him when he was in Australia and help him successfully complete his studies. I also decided that I would read the Sai Satcharitra every day and prayed to Baba to take care of my son in a far away country. I kept my commitment for the first couple of months. But later, Office, family and all the everyday affairs of life took precedence and I could not continue reading Sai Satcharitra. However, it was always at the back of my mind and I would often feel guilty of not keeping my commitment. Shirdi Sai Devotee Appu Vulappa From USA Says: I am Appu, Om Sai Ram to all the Sai Devotee from USA. I am a blessed devotee of Baba. I already wrote my wonderful recent experiences in Hetal ji’s blog. Coming to my Mahaparayan experience I am recently blessed with a baby girl in April, when I was reading Pooja ji’s Mahaparayan post on the blog I was very happy that they are doing such a big thing and I really wanted to participate but so many questions in my mind like can I do this with a small baby and 5 years old hyper boy at home, How will I read when I get monthly cycles. That time I had bleeding for 5 months, so many questions in mind as this was a commitment to Baba. I was worrying with questions for couple of days. Then 2 days after I opened the blog again and I saw Baba’s picture saying the message." start Mahaparayan I will take care of everything" after seeing this, tears rolled over my eyes and immediately I registered for Mahaparayan. Then all doubts and problems got vanished one by one. Next day Pooja ji posted questions and answers for Mahaparayan and my question regarding reading while periods got the answer. Shirdi Sai Devotee Ritwik Gajendra From India Says: My Name is Ritwik. Om Sai Ram to all the devotees, Om Sai Rakshak Sharnam , Koti Koti Pranam to Baba and His Bhaktas especially Hetalji and Poojaji for this divine blog followed by shirdisaibabaexperiences.org; Would like to share the experiences and grace received from Baba during the ongoing MahaParayan journey. The experienced miracles are as follows. Baba entrusted me the responsibility to make a Half Yearly report (H1 report) for the Chairman though there are many reporting levels between us. Wanted to give it a great shot as it was to be submitted to the Top Management. Told Baba even from heart that I am surrendering heart and soul to You and You will only be preparing it. And lo behold! It came out superbly miraculous. Similarly, Baba prepared an article too for my reporting manager. On 13-Nov-2017, had to submit 3 such new assignments but they have now got pushed. Baba, I being Your beggar have faith that You are mercy and compassion Incarnate, will grant me these and will post the successes too. Shirdi Sai Devotee M.Satyanarayana From India Says: My Name is Satya. Sai Ram to all dear Sai Devotees. By Baba's Grace I became part of Baba's Mahaparayana through one of my friend. I didn't know much about Sai Baba before 2007. In 2007 one of my friends got government job, after that he went to Shirdi and that was the first time when I came to know about Baba. By listening to Baba's miracle, a thought came into my mind: that I would also visit Shirdi if I get a job and not even 2 months after this thought, by Baba's grace, I got the job. I went to Pune for training and there my friend asked whether I would also like to visit Shirdi with him the next day. I agreed and both of us went to Shirdi in the next day morning. That was my first visit to Shirdi and I became Sai Baba's devotee forever. Since then every year I am visiting Shirdi. I have a lot of experiences with Baba. Now I will share my experience with you all after starting the MahaParayan. Shirdi sai Devotee Sanjaya Rao From India Says: My Name is Sanjaya and I would like to share a miracle of Baba in our lives that is worth a mention and to be shared with you all. It is always wonderful to experience miracles in our life. I have been an ardent devotee of Sai Baba since 25 years. Every time we make a trip to the sacred land, Shirdi we keep getting new experiences. This time we decided to visit Shirdi before start of the Mahaparayan; it also coincided with the visit of my brother's family to Pune where we are residing. We all decided to go to Shirdi. This time also we experienced a Miracle to see the presence of Shri Sai Baba. To explain this miracle, I must take you back to 2001. Shirdi Sai Baba devotee Dinesh Pathivada from India Says: I am Dinesh and belong to MP 56 group of our Baba. I would like to extend my heartfelt Pranamams to Baba before I speak anything. He saved me from a dreadful situation which changed my perspective towards life. Mahaparayan has been a blessing in disguise for many of us and I am very happy to read how lives of devotees are transforming after starting this. An extended family of Sai Baba in the form of these groups have always stood as a support for me during low times. For this I thank Pooja Garg Maam and Karthikeya sir. My fortune favoured me to come across the Mahaparayan experiences that Pooja ji had before the start of this global work. I felt really inspired when Pooja Ji shared about her experience of about how she got a Neem leaf as an indication to start MP. I am an ignorant devotee until then but Baba favored me by giving an opportunity by registering for MP. My Faith in Baba is like every other person who remembers Him only during their worst times. As mentioned in Shri Sai Satcharitra that man turns to God only when the calamities overtake them. Similar kind of a student I am and Baba has been waiting for me to transform my life in every step of my life. I get my lessons instantly whenever I commit some mistake. What happened today has given me something I can't forget in my life and am happy for Baba have thought of me this way. Shirdi Sai Baba devotee Ankit Joshi from India Says: I am Ankit and I would like to share one of the incident with the grace of Shree Sai Baba. Currently I am having my stay at Gurgaon for my basic AVSEC examinations which are going to be held in New Delhi on 18/11/2017. As we all know that during this time Sai Mahaprayan is going on at global level and today was Thursday, so I was quite nervous that how will I read the allotted chapters for today as I am living in a hotel . It was really hard for me to perform my daily worship along with the 2 chapters of Sai Mahaparayan today, but Sai Baba helped me to complete it with ease, let us see how he helped me. I had to report for training at 8 am in the morning, so I decided with Sai Baba’s inspiration that I will wake up at 3:30am in the morning and after my bath and all other purifying rites, I will perform the worship, but I was also tensed for my worship, as my fellow roommate would not like it or would have got disturbed because of my worship, this early in the morning. This is what I was thinking while I was traveling from Ahmedabad to New Delhi via flight. But Lord Sai came to my help and he arranged everything as per my convenience. Shirdi Sai Baba Devotee Manjula Hiremath from India Says: Om Sai Ram, My name is Manjula. First of all I would love to thank my Deva Sai, then to Pooja Ji as you are doing wonderful seva by making so many people to be a part of paryana and thanks for making me join in all different parayanas like 365 and Khichadi Parayan. 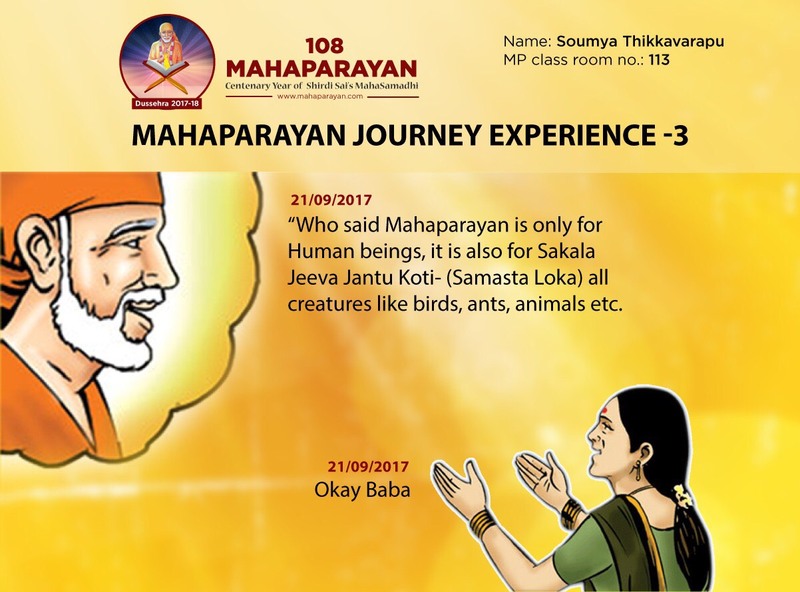 Coming to Mahaparyana experience: I am from Bangalore we have Sai Temple near our home; where we have a big group of 50 devotees and we celebrate Guru Pournima, Vijaya Dashmi and Ram Navami festivals with full zeal together. Shirdi Sai Baba Devotee DhanaLakshmi From USA Says: Om Sai Ram, My name is Lakshmi, today I am going to narrate all the wonderful miracles of my Baba Sai here. One day my son got high fever 104 degrees, I was so scared and prayed to Baba Sai to reduce the fever level and I applied Udhi to my kid’s forehead, by the grace of Baba slowly the fever got reduced. Another experience is that my husband suffered from stomach ache since two months, he went to the doctor for a check -up, the doctor ordered some test to rule out what was going on. In the meantime I was so worried about his health and the waiting time of the result killed me. Wholeheartedly I prayed to Baba Sai to make the reports normal, then we got a call from the doctor’s clinic that the reports are normal and he’s just suffering from gastric problem. Shirdi Sai Baba Devotee Mrudula Dabir from India Says: Om Sai Ram, My name is Mrudula, I am fortunate to be selected by Baba to be a part of Mahaparayana group and Baba made me experience a wonderful Leela. As I did not Have Shri Sai Satcharitra book so I read my parayan from the Pdf copy and my friend Shri Naveenji brought for me the printouts of the chapters every time from that Pdf, however I always wished to read it from the book itself and wished to get the Holy book for myself. Every Thursday I used to pray to Baba to arrange a book for me as I searched it in every possible place in Nagpur, I myself have limitations due to my physical disability and hence I spoke to my group captain Mamta ji about the book. Like this 4 weeks passed, then again I spoke to another captain Savita ji requesting to arrange the book for me, she spoke to her sister Mamta ji and then Mamta ji suddenly remembered one name that clicked in her mind and that was Dipesh Ji Desai, She spoke with him and Dipesh Ji remembered that his friend Mr.Hitesh Gandhi had asked him to take one book in Marathi to Shirdi with him as he had 1 copy with him since long time and there was no taker for it and the same day, he collected it from Mr.Gandhi and couriered it to me along with 2 Hindi copies too as I had requested the same. Shirdi Sai Baba Devotee Haripriya Shankar from India Says: Om Sai Ram, I am Haripriya from MP 130. My small experience is as this, last week when I was doing parayan, and I thought that I should buy a new Sai Satcharitra book in Tamil. As my book was getting damaged since I had been using that for 12 years, I asked my friends whether I can buy the book online. Then one of my friend said she will send me by courier since she is having a copy in Tamil which was touched in Dwarakamai. How much blessed I am to get such a precious book. This week Thursday I'll be reading from my new Sai Satcharitra book. Shirdi Sai Baba Devotee Vandana Lokeshwar from India Says: Jai Sai Ram, I am Vandana. I am extremely grateful to Sai Baba for allowing me to be a part of the Mahaparayan and am indebted to Pooja Ji for giving this opportunity. I started the Mahaparayan and writing “Om Sai Ram” 108 times from the Dussehra day. It really feels like Baba is helping me every step of the way. I wanted to share a couple of my experiences. Last year after the Ganesh festival, we lost a Ganesh idol that my husband had bought in Shirdi. I was really sad. For the one past year I have looked at every nook and corner in my house but was nowhere to be found. However 3 days after the Mahaparayan I found it in my suitcase, It was a miracle! I was elated and so thankful to Baba and it is only by His grace that this happened. Shirdi Sai Baba Devotee Latha Kakhani from India Says: Sai Ram, My name is Latha and I want to share my life changing experience during this Mahaparayan. Right around the time this idea of Mahaparayan was initiated I was diagnosed with a serious health condition that needed immediate surgery and prolonged treatment. Our group was already formed with all members of our local Shirdi Baba temple. I decided to be a part of the group and committed for reading my chapters every week. The day of my surgery was a Thursday and I read my assigned chapter before going into the operation theatre. When I was brought out of the surgery into the recovery room, my husband was asked to see me. I was still not conscious but all he heard was me chanting Baba's name. Knowing how attached I am to our kids, he expected me to ask for them but Baba made me think of only Him. I know it is not humanly possible for us to control our thoughts when we are not conscious, so I firmly believe that Baba was with me throughout the surgery and that is why I was taking His name. Later we were told that the surgery was successful. I owe my life to Baba and I hope and pray He holds my hand while I go through the next phase of treatment. Warm regards to all devotees. Shirdi Sai Baba Devotee Aditi Gupta from India Says : Om Sai Ram, My Name is Aditi and the miracle that happened in my life after the Mahaparayan is that finally after 2 years Baba ended my sufferings today. Sai Baba gave me a government job. I was preparing for PSU exams since more than 2 years, but after giving so many exams I was not able to convert it. In some I reached till interview, but was rejected afterwards. Fear of continuous failure started haunting me. I even prayed to Sai Baba a lot, but nothing was working. However I did not realize that our Sai would surely test our patience but will never leave His devotee’s hand and the same happened with me. Shirdi Sai Baba Devotee Srinandhini Shivakumar Says: Om Sai Ram! I am Srinandhini, Roll No 14 of MP-48 group. 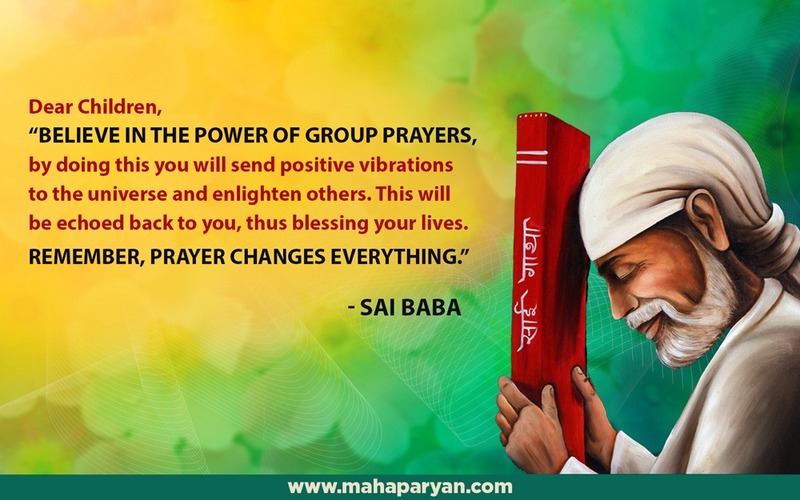 By Sai Baba’s Grace, I would like to share an experience I had after starting Mahaparayan. After the 3rd Parayan, Swami Sai Baba came in my dream on the night of Thursday, 12th Oct 2017. He has given me darshan in dreams before, however this is the first time He spoke to me. I saw a white glowing outline of Sai Baba and His exact words were - "I will go there before you so that I can catch you when you fall." I was thrilled that Swami blessed me like this and was reminded of the chapter in Satcharitra in which His devotees had a similar experience at Kashi and Prayag. I took His meaning as figurative that He will always look out for me in life and catch me if I slip. Shirdi Sai Baba Devotee Swati Ghosh Says: My name is Swati and am a part of "MPE-140 Ankita Sai" team. My humble obeisances to all of You who are toiling hard day and night to make this Mahaparayan happen, may Sai bless you always, please find my experience mentioned below. I am a humble devotee of our beloved Lord Sainath and I earnestly feel that it’s my great fortune that I have been able to become a part of our Mahaparayan Yagnya. I call it a Yagnya, since it is a sadhana for all of us, we who have pledged ourselves at the feet of our Guru Sainath, giving an oblation of all our vices in this sacrificial fire. I really feel Sai gets in contact with us in various forms and this time He has come to us in the form of Pooja and her team. I really cannot imagine how she must have felt after getting those visions of Sainath asking her to conduct Mahaparayan at a global scale. She is definitely a much blessed soul. Sai Baba Devotee Mounika Kodali From USA Says: My Name is Mounika, I would like to share my experience of Sai’s divine blessings after I joined the Mahaparayan group. I feel really blessed to be a part of this group and I thank Sai for giving me such a great opportunity even though I joined at the last minute. Coming to my experience, I am a student; doing my masters in USA. I have joined this group for Baba to fulfill my wish of getting married with the person I love. The day I started reading for Mahaparayan group, I received a call from a company in which I had interned at this summer asking me to join them as a full time employee. Through this group I also got an opportunity to become a part of 365 days satcharitra parayan. This was something I always desired to do (to read Satcharitra daily). Shirdi Sai Baba Devotee Kumari Reena From India Says: Om Sai Ram, Namaste all Sai Devotees. My name is Reena. First of all, I would like to thanks a million to our Merciful Sai Baba and all the Sai Baba devotees who made this Global Mahaparayan successful so far. By Baba’s grace only, I am also participating in this Global Mahaparayan. I read the experience of “Pooja Garg” ji, how Sai Baba ji gave her permission to execute the idea of Mahaparayan. After reading the experience, I always wondered, why Sai Baba drew monkey picture on the mirror, symbolizing Lord Hanuman Ji. I agree 100 % to Pooja Garg ji ,that since we need strength like Lord Hanuman ji to execute this Global Mahaparayan, that is why Sai Baba ji drew Lord Hanuman ji on the mirror. Now coming to my experience, now a days, I am reading “Sreepada Srivallabha Charitamrutam” online originally written by ‘Sriman Shankar Bhatt’. For Sai Baba’s devotees, name of Sri Dattatreya is very familiar. Lord Sreepada Srivallabha is the first incarnation of Lord Dattatreya. Sreepada Srivallabha Charitamrutam is the biography of Lord Sreepada Srivallabha. Yesterday, I was reading Chapter 45 of this book (Pg 316). This chapter drew my attention because, this chapter tells about, the communication between lord Sreepada and Lord Hanuman Ji. How lord Sreepada asked Hanuman ji to take birth in this kaliyug in the form of Lord Sai. That moment, I got filled with emotion, as if Sai Baba ji gave the answer of the question that ‘why Sai Baba drew monkey picture on the mirror, symbolizing Lord Hanuman Ji. Since, Sai Baba is none other than Lord Hanuman ji and therefore , like Lord Hanuman ji, Sai Baba ji will give all the needed power and strength to His devotees, to make this Global Mahaparayan very Successful. This “Sreepada Srivallabha Charitamrutam” book is very interesting to read. While reading this book,http://shirdisaiprarthanasamaj.com/admin/uploads/magazine/pdf/Shripada_Srivallabha_Charitaamrutam_e.pdf . You will find many evidence that our Lord Sai is the incarnation of Lord Dattatreya, It is my humble request to every Sai devotees to read at least Ch 45 of this book once . Please, forgive me If I did any kind of mistake. Yes Reena ji very truly said Baba is incarnation of Hanuman ji. In the dream when Baba drew a monkey on the mirror with Udi which later became Hanumanji; earlier I thought Baba wanted to symbolise strength and our spiritual evolution. But after publishing that experience one of the devotees now also an active MP teacher Mr. Ketan Panchal somehow contacted me ( Baba knows it how as that time my number was not shared anywhere) and shared the above info. He also sent me the hard copy of the holy book. Really Baba’s ways are just amazing! Blessed to be Your devotee Saimaa. Love You so much Baba. Jai Sai…! Shirdi Sai Baba Devotee Bhuvneshwari Rajshekhar From India Says: Sai Ram, Pranams at the lotus feet of Sainath. For the last few weeks since the start of our offering of Mahaparayan, I was reading the chapters in the morning before I go to school. Doing so the whole day, in fact whole week would be so wonderful and blessed that I could feel the immense love and grace of Sai guiding and guarding me. Today as I had a guest in the morning and school from 9-12 noon, I decided to read after my return and so did my reading before lunch. The allotted chapter was 10 - Sai Baba's mode of life. Reading the divine Leelas I was really transported to Shirdi and could re-live and visualize Sai in all His splendor. Recently I also read about how Sai Baba was a Siddha and that He had all the Maha Siddhis and used to demonstrate them. In today's chapter I read about Baba's wonderful Bedsted and the wooden plank about 4 arms in length and only a span in breadth and the beautiful way Baba used to mount and dismount from it. How crowds of devotees would swell to detect the wonderful feat but were not successful though. I just prayed to Baba how I missed seeing all those divine Leelas and that I must merely settle only with imagination and my visualization. Shirdi Sai Devotee Deepa Venkatesh From India says: I am Deepa Venkatesh, Sai Ram to everyone. We were looking for an alliance for my daughter for the past 4 years. Somehow or other her wedding was getting delayed. Situations in the family got worse.That is when I came across this Mahaparayan group and requested the admin. When I began doing the Parayan I was able to get some peace of mind and after the fourth week we got an alliance which we all liked and when I entered 5th week of reading we received a positive reply from the groom's side. Now my daughter is happily engaged. All praise to Shri Sai Baba, the life she has received now would not have been possible without His blessings. I am indebted in serving Baba for the lifetime.